A detailed project management plan has been drafted showing clearly the various steps/stages in the process including timelines and milestones for delivery, the number of days for each task, arrangements proposed for quality control of the outputs/deliverables and project management and leadership arrangements. To regularly update and provide feedback to the Steering Group and to attend WDMP meetings as required. 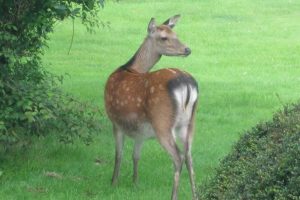 To promote the efficient use of the Open Season for Deer as a deer management tool and if further required, the use of Sec 42 licences to reduce the deer impacts in these DMUs to acceptable levels. Where necessary he/she will co-ordinate the application for and use of these licences. To prepare and submit progress reports and a final report to the DAFM and DHG in order to facilitate drawdown of payments. The successful applicant will be a self-starter who can work independently. He/she must have leadership skills with strong organisational skills and have a proven track record in project management. He/she will have excellent record keeping skills. The successful applicant will have a practical knowledge and experience of working with landowners, farmers and multi-stakeholder groups. Candidates must have a full driving licence and suitable transport. The post will require time spent outdoors and will involve meetings outside of normal office hours. A qualification in a relevant discipline is required. Relevant experience in deer or species management would be a distinct advantage. The successful candidate will report to the Steering Group on a regular basis. Line management will be provided by WUC Co-ordinator. This is a part time three year fixed term contract based on a 2.5day week which is subject to successful drawdown of funding from the DAFM/DHG. The Contractor will provide his/her own office facilities and equipment and will be positioned remotely. The Contractor shall not be an employee of Wicklow Uplands Council and, as such, shall be responsible for their own income tax, social welfare contributions and any other levies required by law to be paid. Work hours are flexible provided that the co-ordinator can fulfil their duties.